I volunteered at my local Scholastic Warehouse sale this week and earned free books! I always love this sale because I get to be surrounded by books for hours and then I get to bring books home with me at the end of it all. 🙂 Check out the books I got in my book haul section below! Like everyone, I spent WAY too much time this week trying to figure out the GDPR thing. I think I’ve done enough to satisfy the legal requirements, but who knows really? Oh, and how annoying has it been to receive five million emails about updates to privacy policies and re-subscriptions to email lists? Ugh! I realized that I missed one of Kate L. Mary’s books, and I needed to fix that immediately. Picked up Outliers in anticipation of book #2 in this series. I got most of these for free with the money I earned for volunteering (I paid less than $10 for all of this). This made laugh so hard: Florida city warns residents of power outage and zombies. The absolute best part is that the city official said the city “does not have any zombie activity currently.” Apparently, he’s not ruling it out. LOL! I don’t usually post Instagram giveaways, and this isn’t even technically starting until June 1st, but I’m making an exception because Cait @ Paper Fury is giving away a signed and annotated copy of A Thousand Perfect Notes, and I knew you’d all want to know about it! Kristin Kraves Books is celebrating her one year blogoversary with a giveaway! Wow, you got a lot of books. I hope you enjoy them! That volunteer job sound great. I used to volunteer at the snack stand in high school, but they’d never let me eat any of the snacks. Ha! Yes, if you’re going to volunteer, you at least deserve some perks. Volunteering for free books? That’s awesome! I liked Pros of Cons. I wasn’t sure what they were looking to achieve at the very end of the book, but the friendship was wonderful. I thought about volunteering for BEA/BookCon, since I live so close to NYC, but then I never do. This whole GDPR thing will work wonders for my email book, because I had subscribed to like a million author newsletters, and now I don’t have to unsubscribe. I’ve always thought it would be cool to volunteer at a big event like BEA. Don’t know that I’ll ever do it either, though. Glad GDPR was good for something! I remember volunteering for this book fair, but I didn’t get the same book perks. Great choices for so cheap! And yes, all the verifying newsletter emails were very tiresome. You don’t get free books for the fairs at the schools, but you do for the warehouse sales. Thanks for sharing the books…and enjoy them all! Have a great weekend…and upcoming week. Oh the book sale sounds great! The GDPR stuff gives me a headache! Enjoy your new books and have a great week! I think we all got headaches from GDPR! I’m with you about the new GDPR things. I get ten emails per day about this and it is bothering me so, so much haha. I’ll always put in labor for free books. LOL! Hahaha I am with you on all the mails that we got related to GDPR! So, I love the Scholastic Warehouse sales, but I have not ever volunteered. I should do that next year. Maybe get free books that way instead of spending so much of my own money. The GDPR emails are insane! I need to figure out what all I should do over on Blogger. Blogger put a message on my site I think, just don’t know what else I need to worry about. Have a great week! It’s a great way to earn books!! You can actually check out the Scholastic website to see if there’s going to be a Scholastic Warehouse sale near you (and then I think there’s a link to offer to volunteer). Good Lord. The blogging world is all shook up with this GDPR thing. I haven’t a moment to read about it because this week has been hectic for me but I will take the time for sure. I honestly don’t think GDPR is going to really matter for most bloggers, so I wouldn’t stress about it. But it’s always better to be safe than sorry. Ooh nice!! Lots of new to me ones here! Though I did just pick up Rise of the Isle of the Lost at HPB today! It was marked for $4 plus another 20% off! I still need to read book 2 but I couldn’t pass up such a deal for the the third one! Hope you enjoy all the awesome new reads! Volunteering at the warehouse sales is WAY different than doing it at the schools. I never earned anything when I volunteered at my kids’ schools. Here’s a link to the page on Scholastic’s website to see if there’s a sale coming up near you soon! GDPR has been fun, hasn’t it?? And yay for the book fair- coming home w/ books is ALWAYS good, I agree! Looks like a nice haul! The zombie thing made me laugh so hard! Kate L. Mary (who writes the Broken World Series) shared it in her author FB group. She shares the funniest stuff there—I’ve never loved an author group so much! All that GDPR stuff is so confusing, but I THINK I have it all covered? I’m going to still check out some of these blog posts I’m seeing that I haven’t read yet though just to check. Ooh thanks for sharing about Cait’s upcoming giveaway. That would be awesome to win!!! I’ve decided I’m fine on GDPR—it’s just enough to make your brain explode! Ooo, the Scholastic event must have been a lot of fun! That’s an excellent haul and well worth the time spent around even more books, I’d guess 🙂 I second your ‘ugh’ over GDPR. Like you, I think I’ve done everything necessary? I just hope now that the date has come and gone that most of us bloggers can put all that stress in the past! 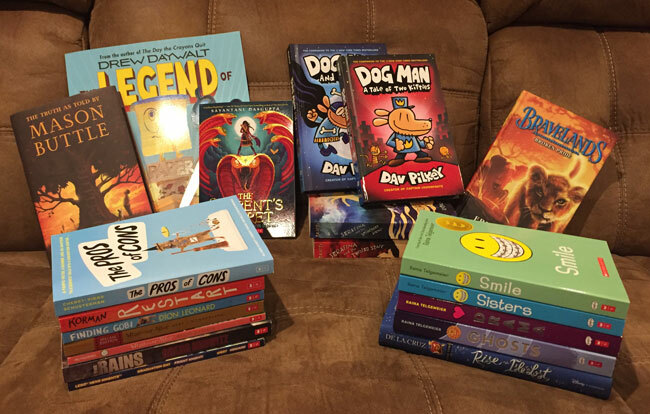 Sounds like the Scholastic sale was a lot of fun, and what a great haul! I found it hard to get my head around all the GDPR stuff as well, but finally got it sorted last weekend. Thanks for the links, those look interesting. The sale was definitely fun! Who wouldn’t love being surrounded by books!? I loved those Scholastic sales when my daughter was in school. When I was young it was Weekly Reader and my parents let me get whatever I wanted which was seriously like 20-30 books every time. I think they did those every 3-4 months. I love celebrating my blogger friends’ special occasions! Yay volunteering and free books! two of my favorite things 🙂 I’ll have to check what they have around here so I can volunteer too! Yes, definitely look at the Scholastic website for their warehouse sales. I think they have them all over the country. I’m so glad GDPR is done. It was the biggest hassle getting everything compliant! I’ll for sure mention your challenge in my Sunday Post tomorrow. Thanks for bringing it to my attention! I completely agree, getting all of those notices through email was overwhelming. I never realized how many authors I was signed up with lol! And that’s an awesome book haul! My oldest just read the first Super Diaper Baby book and now he wants to devour all of that authors books. He loves them, yay! Now I need to go find other authors with a similar writing style too…..
My son loves the DogMan books! And, yes, it was certainly overwhelming with all the emails. I’m glad they’re mostly done.